Facebook, Uber, and Microsoft’s Xbox LIVE marketplace have all shared time in the spotlight for leaking customer data. Loose security measures have put millions of individuals in harm’s way. Identity theft is what happens when someone’s personal information has been stolen for fraudulent purposes. A thief will obtain confidential information such as Social Security numbers, bank account information, phone numbers, addresses, and medical policies to open new fraudulent accounts or to access already existing accounts. Juniper Research predicts that in 2023 alone, more than 33 billion records will be exposed via criminal data breaches, a 175 percent increase over the 12 billion records that was expected to be compromised last year. The best way to protect yourself from identity theft is to educate yourself and take appropriate action. Continue reading to learn more about the danger of identity theft, common forms of identity theft, and identity theft prevention. According to the 2018 Identity Fraud Report, 16.7 million Americans were victims of identity fraud in 2017, an 8% increase from the year before. Thiefs collectively stole $16.8 billion dollars from consumers. Depending on the type of breach, thieves can access Social Security numbers, credit card numbers, birth dates, addresses, phone numbers and driver’s licenses. With this type of information, thieves have potential to steal significant amounts of money from average consumers, open up new accounts in their names, file taxes and collect the refunds in their names, and more. Though most people recognize that identity theft is often linked with one’s finances, many don’t realize that identity theft affects victim emotions, physical wellbeing and relationships. This abuse can impact one’s ability to access necessary services such as housing, loans, and employment opportunities. In a study by the Identity Theft Resource Center, researchers found that 85% of the identity victims they studied felt angry and frustrated. About the same amount had issues with sleep. Half of participants had lost interest in the hobbies and activities they used to enjoy prior to the theft. More than half had chronic physical pain and headaches. In addition to the emotional and psychological impact, many lost educational opportunities, faced employment troubles, and encountered issues with accessing insurance benefits. Victims of identity theft face frustration when they have to tell their story repeatedly to different financial and governmental institutions. Identity is a very difficult thing to restore. The impact of identity fraud is felt for life. Thieves can get ahold of your information through several different means. Sometimes, we make it easy for them. We live in an age where we are used to having our lives on display. We post baby announcements with our children’s full names and birthdays detailed. We check in at restaurants and let the world know. We allow marketers to track our search histories and emails. We are used to sharing our details and can let our guard down. Cons can get our information by sneakily asking for it by phone, email, or online. Because we are used to clicking on different links or sharing our information, cons can easily convince people to download malware, ransomware, or to offer up personal information. It’s not only us who might share too much information with a hacker. Major retail and financial institutions have put our data into the hands of criminals. Many retail vendors, restaurants, and other types of businesses have had their payment systems hacked, handing over credit card information and names over to thieves. Saks and Lord & Taylor, Chipotle and T-Mobile have all experienced such types of hacks. Large financial institutions who have your information without your full knowledge have even been part of huge mishaps. Equifax is a major US credit reporting agency that has access to personal information on any consumer with a credit report in the US. In 2017, Equifax leaked sensitive information, including social security numbers, full names, birthdates, addresses and some driver licenses, of 143 million Americans. This means that almost half of American citizens had their information exposed by a company that they may not have even heard of. It’s one thing to have your information exposed by a company you consciously do business with, but another to lose your privacy from a company who has your information without your full knowledge and consent. All consumers are at risk, either through scam attempts or through high level hacking. Thieves target different groups of people with different strategies. Identity theft can take form in many different ways. We will discuss the most vulnerable groups of people prone to attack and ways criminals use vulnerability to their advantage. Anybody with a social security number is at risk of identity theft, regardless of age. More than 1 million children experienced identity fraud in 2017. Child identity theft happens when a criminal steals a minor’s social security number for nefarious purposes. Thieves can use this personal information to open up bank accounts, apply for loans, receive government benefits, rent a place to live, or even apply for a job. If you are concerned about your child’s security, there are preventative actions you can take to protect your child and support resources if your family is experiencing this violation. Senior citizens, those over 60, are prime targets for identity theft. Older Americans are targeted because they are more likely to have larger life savings, own homes, and stable credit. They are also more likely to be deceived, scammed, and are less likely to report fraud. To prevent fraud, seniors and their loved ones need to be careful of in-home caregivers who seem particularly interested in their financial history, unexplained withdrawals and purchases, and financial statements that have not been delivered. Depending on age and health, seniors often need the support of their family members to watch for suspicious changes in power of attorney, bills, and financial activity. Hiring an accountant can be a helpful way to make sure an older relative stays safe. Criminal identity theft is a particularly dangerous type of identity fraud that can challenge your legal standing. Criminal identity theft happens when a perpetrator commits a crime using the identity of an innocent person. For example, if a driver gets pulled over and presents a fake ID to the police, they are committing criminal identity theft. This can cause legal trouble for innocent victims of fraud. This particular type of impersonation can happen when a criminal gains access to your paperwork, identification cards, and bank information. Criminals can also commit cyber crimes while impersonating others, causing almost irreparable damage to a person’s reputation, employment, and relationships. Most victims become aware of this violation when they apply for background checks for work or other official legal processes. Others might be confronted by the police or discover a warrant out for their arrest. Financial identity theft happens when a person’s credit card and bank account information, along with other personal details, have been compromised. Criminals will use this information to make purchases or to open up new accounts in victims’ names. Criminals typically change the mailing address on the victim’s account to prevent statements from being mailed to the address. One study of victims who contacted the ITRC found that 60% of respondents experienced new account fraud. New accounts are appealing to thieves because victims do not detect the changes quickly. They are unaware of charges and loans being created in their name. Thieves are mostly motivated by money so individuals who experience identity theft are sure to be affected in some financial way. With this specific type of crime, perpetrators will steal personal information to receive others’ tax refunds or claim tax benefits. Individuals commit this crime by accessing a victim’s personal information and filing a fraudulent tax return. They file these false tax returns early in the tax season before the average person submits their legitimate information. The IRS typically delivers returns within 3 weeks. With this quick turnover, thieves can usually convert the check into cash before the victim even knows they have experienced an attack. Victims usually discover that they have experienced this type of identity fraud when they file taxes and the IRS informs them that there is a problem. According to IRS records, this taxpayer has already submitted their tax return. Other warning signs for tax identity theft include an out of place collections notice, notification from the IRS about discrepancies in your income reports, or receiving tax information from an unknown employer. Medical identity theft occurs when a criminal uses one’s personal details and health insurance information to claim medical benefits. They may visit doctors, get prescriptions filled, and file health claims. This can affect your insurance and payment plans. This can also affect one’s credit score. A way to detect medical fraud is to stay up-to-date on your insurance policies and statements. If you see discrepancies in what health issues are recorded and what care you have received, call your insurance provider. Be on the lookout for unexpected medical bills and calls from debt collectors, unexpected notices from your health provider, and denial of insurance benefits. Over 50,000 military consumers reported identity fraud in 2017. Military members are vulnerable to identity theft because they will be on active duty for long periods of time. When they are far from home and focused on their duty, they often miss changes in their accounts. It is suggested that military personnel should request an “Active Duty Alert” on their credit file. This prevents criminals from opening lines of credit while they are deployed. Though each type of identity fraud has different characteristics, there are some precautions you can take to help protect you against data theft. Monitoring your accounts consistently will help you detect any concerning activity early on. The quicker you discover that your information has been compromised, the less damage a thief can do. Americans are entitled to one free annual credit report. A credit report will include your trade lines (open accounts, dates opened, type of account, balance, etc. ), credit inquiries, and public records. Checking your credit report annually can help you ensure that no new accounts have been fraudulently opened in your name. Identity theft protection programs can also help you keep tabs on all of your accounts. These softwares can provide you alerts, reports and support if you do experience identity abuse. They also offer antivirus software to keep your computer safe from hackers. If a stranger or unknown business contacts you offering a job or service, do not offer your personal information to them. If you see emails in your inbox or messages on other platforms with odd subject lines or content, avoid opening them or clicking on any links they may contain. Be cautious when people or suppliers you usually do business with say they have changed their banking account information. Websites that offer free downloads, specifically music, videos, and adult content are more likely to spread viruses and malware on your computer. Senior citizens in particular fear that online banking will make them more open to attack. On the contrary, online access to accounts makes it easier to detect suspicious activity. Banks send digital alerts immediately when there is suspicious spending on your accounts and make it easier for users to access their accounts whenever they want. Other accounts, such as phone bills and retirement investments are easier to monitor when they are online. Investment accounts sit for years, if not decades, without anybody pulling money out of them. This can lead investors to put them at the back of their mind and not closely review account activity. Hackers can access thousands of dollars without anybody noticing. Accessing these accounts online allows investors to easily monitor their accounts in real-time. Online accounts are great, but remember to use strong passwords and different passwords for each account. If there is a data breach and thieves access one of your passwords, they may have access to all of your accounts if you have not diversified your access information. 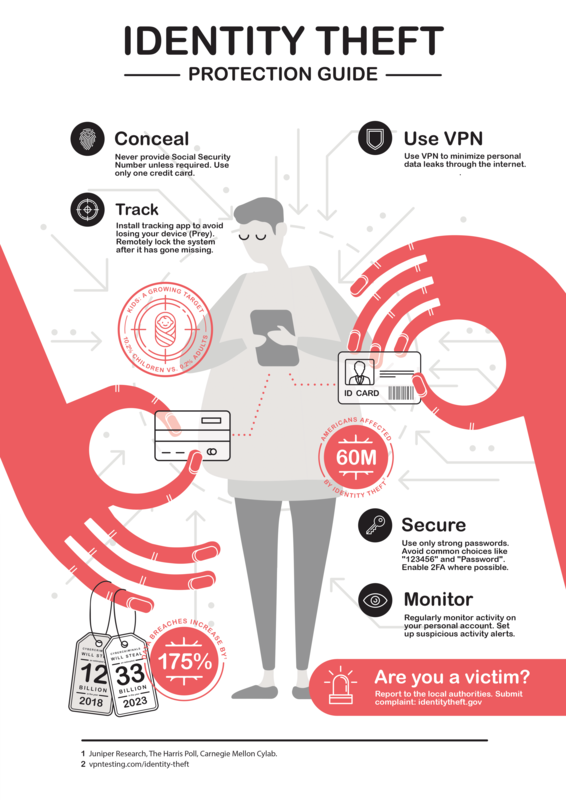 Virtual Private Networks – VPNs – are the safest way to encrypt your data, hide your location, and thwart hackers from accessing your information. A VPN acts as a tunnel and encryption service for your information. This means that your data- your passwords, your emails, and your web history- is scrambled and undetectable to hackers seeking to steal your information. This security measure is one of the most reliable and affordable ways to keep your personal accounts and passwords safe. VPNs should always be used when using public WiFi and unsecured networks. Any amateur hacker can easily access your computer, browsing activity, emails, and account information when using an unprotected public network. A VPN is a way to ensure your privacy and security when at hotels, airports, and restaurants. No matter your age, bank of choice, consumer activity, or profession, you are at risk for identity theft. Data breaches happen at all types of major institutions. Even financial institutions you have never interacted with can have your data and lose it. You can never have complete control over your information, but you can take steps to prevent major damage, and to react swiftly and appropriately if it does happen to you. When you see warning signs of identity theft or unexplained financial activity on your accounts, notify your bank, place a fraud alert on your credit report, and report this crime with the Federal Trade Commission.